Chicago based MT Coast is one of those artists that utilises field recordings correctly. I have never been a lover of those who go out and record anything they come across and just release these as untreated, nonsensical albums that beggar belief as to why any label would stump up their hard earned cash, let alone the consumer. MT Coast however, is the shining light that all these ‘artists’ should aspire to be. A clever understanding of source material is where ‘Beach++’ truly comes alive. 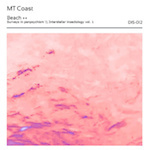 From the high frequency, rich electronic surging ambience of ‘Bee Wonder’, to the glitch infused, harmonised beauty of ‘Scarescarab’, it is immediately evident that MT Coast has a handle on making actual music as opposed to random noise. ‘Alone @ 52hz’ is reminiscent in some respects of ‘Stairway to the Stars’ by The Caretaker. The flowing ambient drifts are akin to feeling like you are slowly rising through deep water and it’s this feeling of submersion that is the necessary counterweight for the lighter notes that add buoyancy. The last two tracks are a direct opposite of one another. The electronic bleeping glitch of ‘|3uRowZ’ provides a break between ‘Alone@52hz’ and the filtered sub level beauty of this albums finale (and title track if you like) ‘\openup\ & Beach++’. I truly enjoyed this album from start to finish. Reminiscent in part to some of the works of the mighty Fennesz and such like, there is little on this release that there isn’t to like. A glorious release from start to finish.